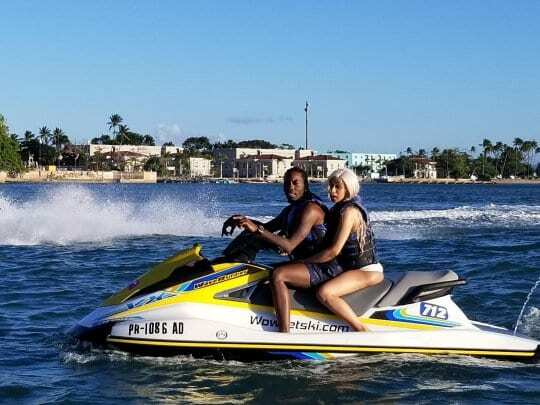 Cardi B was trying to enjoy jet skiing with her husband, Offset, on the low, but apparently, the water sport company sold images of them to TMZ. Bardi was spotted in Puerto Rico over the weekend because she was set to take the stage at the Electric Holiday Festival. The Migos rapper was just there to calm her nerves and she shut down any speculation of them getting back together. “No, I just had to get f—-d, that’s all,” she said on Instagram live before flashing a big smile. Earlier in the live, she blasted the jet ski company who sold images of them to the tabloid. The future of the couple has been in the air since she announced that they were getting a divorce. Since then, Offset has made multiple public apologies, including an extravagant one at her headlining Rolling Loud Festival set. But she claims there’s no update on their relationship since her last one.